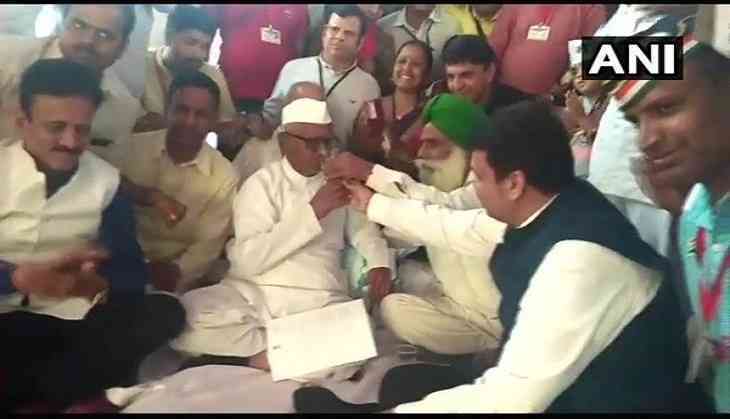 The Gandhian social worker, Anna Hazare, who was on a hunger strike for the rights of farmers has put his strike to an end. Anna Hazare was on strike since March 23rd, he was demanding for the minimum support price for the farmers and drafting of an empowered Lokpal Bill. All the demands made by Anna and his supporters have been accepted. Anna Was on a hunger strike since last 7 days. The acceptance of the demand has been announced by the Agriculture minister of the Maharashtra state Gajendra Singh Shekhawat. There are also reports of the deteriorating health condition of Anna Hazare. It is being reported that CM Devendra Fadnavis and Agriculture minister Gajendra Singh Shekhawat were physically present while Anna ended his fast by having a glass of juice. Anna has reportedly lost more than 5 kgs of weight. Speaking to media, Fadnavis assured that the Central government has taken positive decision on Hazare's demand. "Central government has taken affirmative decisions on most of Anna Hazare's demands," Fadnavis said. The Maharashtra government further averred that "a committee has been formed for the demand approval of Anna Hazare."